Featuring a foreword by the Anglican Archbishop Michael G. Peers, Liturgies for Christian Unity is an anthology of the very best approaches to celebrating common religious ground. Containing prayers and texts from the past 100 years of the Week of Prayer for Christian Unity, it offers a wide range of ideas for liturgies of all forms and sizes. Its inclusiveness and its usefulness make it a required resource for parishes, retreat centers, chaplains and educators in all manner of situations. This resource is the fruit of rich work by the Faith and Witness Commission of the Canadian Council of Churches, under the guidance and leadership of Rev. Judee Archer-Greene, Rev. Richard Vandervaart and Dr. Mary Marrocco. 2. 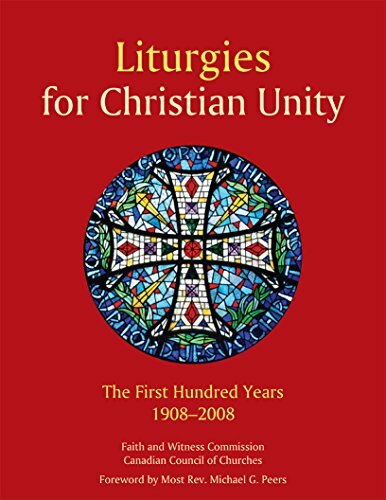 Liturgies for Christian Unity, the First Hundred Years 1908-2008. Faith and Witness Commission of the Canadian Council of Churches.